I was recently one of many people chosen to participate in the recent Glam Sense campaign for Biore Deep Cleansing Pore Strips. If you've never heard of Glam Sense, it's run by Topbox. It is a program you can join, and they send you free products in exchange for your honest review. It's pretty much the same as influenster, chick advisor, bzzagent. Those types of programs. It's free to join, and when they have products that need to be tested, they send out qualification surveys which then determines if you will be chosen for a specific campaign. The campaign I was chosen for, is the Biore Deep Cleansing Pore Strips. Also included in the package, was a sample size of the Biore Baking Soda Pore Cleanser, I thought we were going to receive only the Biore Deep Cleansing Pore Strips, so this was a nice surprise. I'm not going to review the Baking Soda cleanser just because this review is specific for the nose strips, and I'm afraid to use baking soda on my face. I'm sure most of us have experienced nose strips at some point in their past, and maybe even recently. It has been a few years since I have tried them out, so I was excited to see if they still worked like they used to in the past, or if the application has changed. Excuse the super unflattering picture, but I made sure to wash my face, and apply the nose strip to clean skin. The directions say to take the strip out of its package with dry hands. Next you wet your nose, and with your dry hand, you apply the nose strip. Having your nose wet helps the strip stick better to your skin. You wear the nose strip for 10-15 minutes, or until it hardens. I chose to keep mine on for the full 15 minutes. I'm not going to show a photo of what the nose strip looked like once I removed it, but I will say that I was impressed. I don't really have super large pores, but the pores that I do have (and are somewhat noticeable) are on my nose. 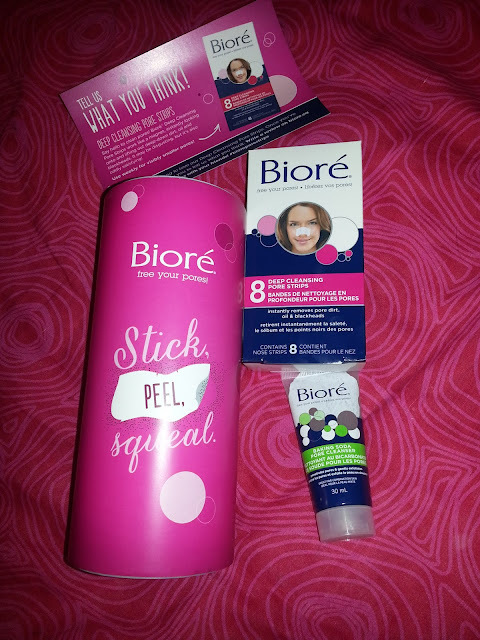 The Biore Deep Cleansing Nose Strips did remove some of the larger blackheads that I have there, and even little ones I didn't know were there. The first time I used it, it seemed to miss some of the larger pores, however the second time I used it, it managed to pick more out. 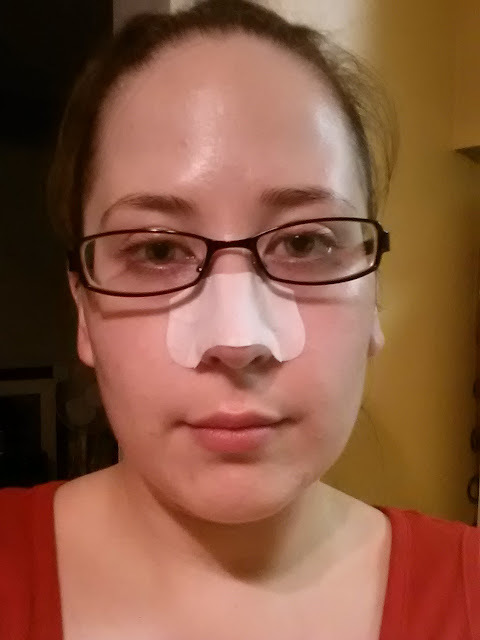 What I didn't like about this nose strip, is once it hardened, it was REALLY tough to remove from the nose. So you have go very gently or else you might rip your skin off. Also, it left a little bit of a residue on my cheek area, and it was SO itchy. I made sure to wash it off right away the second time, because the itchiness was unbearable. Would I purchase these in the future? Yes. They are affordable, and are nice to have on hand if you seem to be noticing some more pores popping up on your nose. I wouldn't recommend doing it every day, but maybe once or twice a month.